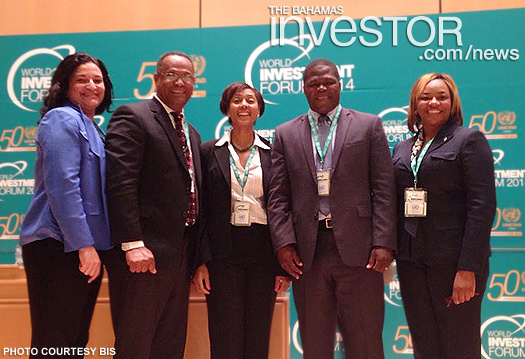 Members of the Bahamas Investment Authority (BIA), Ministry of Grand Bahama and Ministry of Investment are in Geneva, Switzerland, this week attending the World Investment Forum (WIF). Under the theme Investing in Sustainable Development, the forum runs October 13-16, 2014 at the Palais des Nations. Minister of State for Investments Khaalis Rolle is expected to speak on the topic of how to finance the sustainable development goals on the third day of the conference. The WIF is a high level, biennial assembly that provides a global platform to engage policy makers, the private sector and other stakeholders in discourse on foreign direct investment policy formulation and promotion. Minister Rolle and Minister for Grand Bahama Dr Michael Darville are leading a delegation that includes the director of investments at the BIA Candia Ferguson and project officers Melissa Forbes and Leslie Dorsette from the Ministry of Grand Bahama. In addition to the forum, the BIA will conduct presentations on investment opportunities in The Bahamas generally and in particular on Grand Bahama. Other countries participating at the forum include the US, the United Arab Emirates, Jamaica, Dominican Republic, Zimbabwe and The Netherlands, among others. United Nations Economic Commission for Europe will also participate.